HI, no didn't seem to cause any marks, I pushed pretty hard at times especially at the toe and book came out unscathed. HI, some time ago I put on a post about sewing shoe soles on the Cowboy CB4500 with the narrow foot set, many people asked to see it in action and I really dropped the ball and didn't do much about it because of other commitments and just plain laziness. We just happen to be Australia's Cowboy dealers however this can be done equally as well on a Cobra or Highlead and so on. There are a couple of narrow feet sets available for these machines, but this set seems to give the best access along with a modified narrow slotted plate.....I had over 50 years of sewing but very little to do with shoes, really only repaired a few pairs of sandals, so to do this job meant standing at the end of the machine and pushing the boot against the modified plate, very much against my usual method of just holding the leather straight and not exerting any pressure!! With this foot set the inner foot sits in front of the outer foot and the needle, the other foot set (last foto) the inner foot is as per norm and has a hole for the needle. Doug I don't think of them as junk, for the money they are exceptional. I was pointing out that patchers (in general) are designed for repair work, not quality sewing, if you produce a good quality stitch then that's great.....I am not embarrassed to own one. We don't sell a patcher as the patchers from our own supplier didn't pass our scrutiny... so there is no clash with out own product. Thanks Mikesc, yes I still have the machines. I might have sounded harsh re the patchers, it wasn't my intention. They do in fact punch above their weight. Of the three I have, one is set up on a block of heavy timber and I do use it from time to time, its fine. The machines are relatively trouble free from my experience. When we sell machines some people have machines already and can sew, some others are newbies and often they will buy the simplest machine they can, so often that is a handcrank of some kind. The reality is that handcranks are not really easier as you are cranking, feeding the material and your eye can move a bit too. So a greater proportion of people buying the little patchers are going to be first time machine owners and there is going to be a greater learning curve...… ie its expected then that these people will experience more problems. To put it another way, I get a lot more phone calls for assistance from people that have not sewn before than those that have on any machine I sell. Are you talking to me? I don't recall saying the machines were junk. They are cheap but do in fact sew quite well. We run Australia's biggest and most successful heavy leather machine company so we did not shoot ourselves or anyone else in the foot. Sometimes when you buy some Kellogs Corn Flakes you get a cheap plastic animal, does that make the corn flakes rubbish? Darren and I are friends, though he is not answering communication at present. He admitted himself that he messed up pretty badly and we and others have been trying to help those that did not receive machines, did not get machines that worked, did not get machines back that were in for service, did not get their full orders and so on. I'm guessing you will not see him here or anywhere else until the creditors disappear. It is an awkward situation, a lot of accusations and threats have been made. As a veteran of many years in business and a couple of recessions I know it can happen to anyone. With regards the Chinese Patcher, I did not mean to make anyone feel insecure about owning one (I have 3), I was intending only to point out they are designed for repair work, not quality leather work. They do punch above their weight, a reasonable stitch can be had, though the needle will only take quite thin thread. Darren emailed me a manual a while back as we were giving the patchers away with more expensive machines and I wanted to compare his manual with what I had written for ours, however I have searched and so far cant find it. I think one small advantage of the handcrank on the end flywheel is that you are cranking in the same plane, wheras with front wheels the rotation is not the same direction as the sewing. 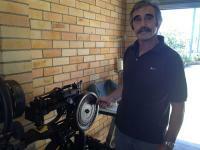 Hand cranking standard end flywheel machines like the 2500 and 3200 is fine and we do both here at Cowboy Leather Machines in Australia, it only takes a minute or two to get used to the motion. However as you say it will really only work on short bed machines, you cant really hand crank a cowboy CB4500. We commonly fit hand crank handles to the Cowboy CB2500 and CB3200, additionally there is now the Cowboy Outlaw. In older machines some 29k had them, older Durkopp and of course the Pearson no 6 and Landis no 1. I thought we'd had just about every 45K model thru our workshop and showroom, but never one with a front mounted handwheel !! the old Singer manual test was holding the thread taut at 45 degrees and seeing if the needle slid down it, or I find if the thread is difficult to shove thru the eye of the needle then you need a bigger needle, or if it slops about then a smaller needle. In the end the machine will sew badly with the wrong needle.